Vergelmer was formed out of the ashes of the death metal band Abemal in June 1993. They recorded some rehearsal tracks before finally releasing their debut album through Cacophonous Records in 1997. They then broke up in 1998. They had also recorded one mini album called "Origo Malitiae" at the same time which was supposed to have been released as a split cd with Sigh but since Cacophonous more or less went bankrupt it never became reality. Instead the later deleted material was released through the American Ultima Comparatio Productions in 2000, the same guy behind the magazine Ultima Comparatio. Formed in June 1993, Vergelmer were spawned from the ashes of Swedeish Death Metal band, Abemal, when guitarists Nazgul and Yngve decided to start a new project. Later the same month they unearthed the individuals they needed to join them whilst at a local gig, when two members of the band they had gone to see proved to be exceptionally talented. The group's vocalist, Ebboth, and drummer, Maunghrim, agreed to work with them. Their bass player was Grimulv, who had previously handled the drums for Abemal. With this final piece of the jigsaw in place, the final line up of Vergelmer was complete. They recorded several rehearsal tapes to spread on the underground as well as two demo tapes: "In The Dead Of Winter" and "Darkness Forever". These demos were sold only through the band and through small cult distributors. As a result, many people got to hear their music through trading, though the tapes engendered a positive reaction from individuals and publications alike. In 1994 Maunghrim left the band and the remaining members switched instruments, with Grimulv turning drummer once again and Ebboth playing bass. Later that year, Yngve, left in order to continue his studies and the band became a three piece. During that year, the hiatus in the band meant that members had time to pursue other projects. Ebboth began working on a solo project and Nazgul devoted a great deal of time to his other band Algaion. In mid 1995, Yngve rejoined the band and later that year, Vergelmer entered Abyss Studios to record their third demo, "The Third Winter". It was this cassette that in early 1996, the band began to approach record companies with a view to releasing this tape as a mini-cd or split album. One of the companies they approached was London based label Cacophonous, who were suitable impressed to offer them a deal, which the band accepted. 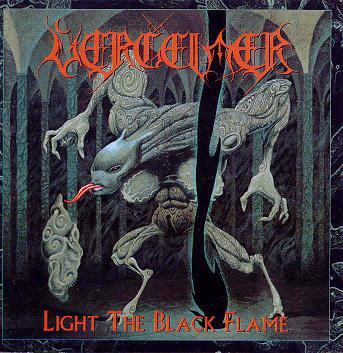 In November 1996, Vergelmer entered Abyss studio once again to record their debut opus "Light the Black Flame" for Cacophonous. The release features nine tracks of Satanic Metal, with cover art specially commisioned by reknowned Occultist and artist, Robert Taylor.